JOHANNESBURG (Reuters) - A larvae outbreak which has damaged maize in South Africa's Limpopo and North West provinces is "strongly suspected" to be the invasive armyworm that has attacked crops in neighboring countries, a scientist said on Monday. The infestation of fall armyworms - an invasive Central American species that is harder to detect and eradicate than its African counterpart - has erupted in Zambia, Zimbabwe and Malawi and follows a crippling El Nino-triggered drought which scorched much of the region last year. Countries with confirmed outbreaks can face import bans on their agricultural products because the armyworm is classified as a quarantine pest. Johnnie van den Berg, an entomologist at South Africa's North-West University who has collected samples from affected farms, said taxonomic tests were being done for confirmation. "It needs to be identified by a taxonomist but we strongly suspect it is the fall armyworm ... Visually, it looks 100 percent the same," he told Reuters in a phone interview. "It may be confirmed by the end of this week," he said. Van den Berg said coverage in South Africa was not "blanket", with outbreaks reported many kilometers (miles) apart in some places, but northern Limpopo province, bordering Zimbabwe, seems to be the epicenter. The impact varies: some farms have had minimal leaf damage, others have been devastated. "On some farms, there has been 90 percent damage and nearly all the leaves have been stripped from the plant. It looks like a row of broom sticks," he said. South Africa is expected to have a maize surplus this season after a deficit last year when 7.5 million tonnes of maize was produced against national demand of 10.5 million tonnes. 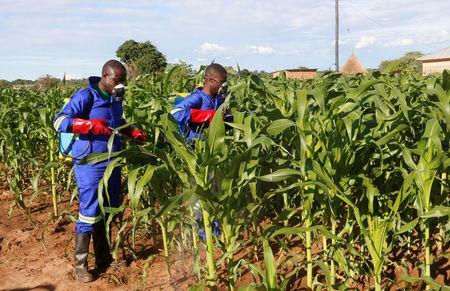 Industry sources have said while an armyworm outbreak would be unlikely to push the crop into deficit it could reduce the size of the expected surplus. "This fall armyworm is a Central American pest. Here we will need to do more research to see where and how it establishes itself," Van den Berg said. He said the continental invasion began in July with outbreaks in Nigeria and Sao Tome and Principe. It remains unclear how it jumped across the Atlantic. But the moths can be carried long distances by wind and may have winged across central Africa that way. The moths lay eggs in maize plants and the caterpillars have also been known to march en masse across the landscape - hence the name.